I was really, really happy with the weather. As you read here previously, the weather this September has been sucktastic. Normally a warm, sunny month with little rain, this year it was rainy and cool. We got poured on during the last ride I led, the Three Speed Ride on Saturday September 21st, so I really preferred to not have a repeat of that. 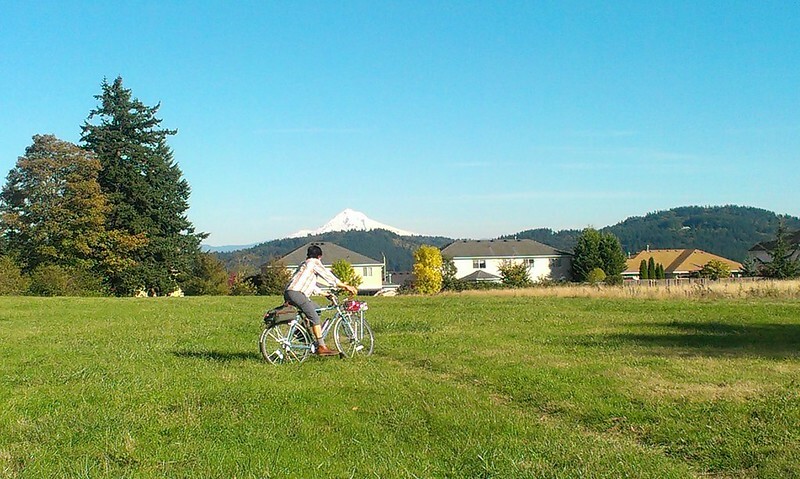 And the Cascadian Weather Gods heard my pleas and gave me a day of great weather: sunny and 73F/23C. 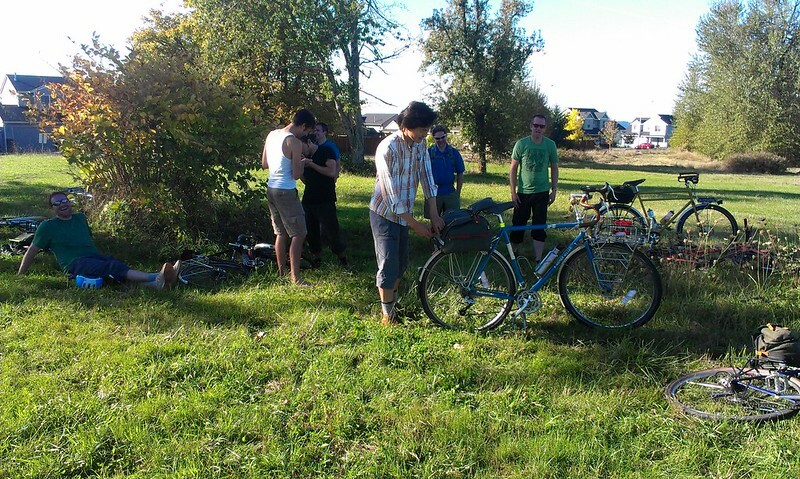 We had nine people for this Country Bike Ramble, eight at the start and Christopher met us half-way through the ride. The first leg of the ride wound though paved and unpaved streets from Fernhill Park (the start) through NE up to Rocky Butte. 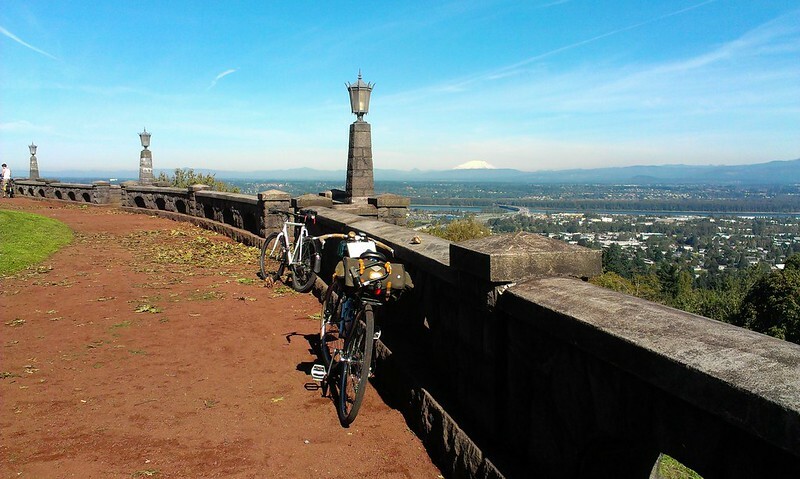 The views were great from the top, and I’m always happy to have “Rocky Butte Virgins” on a ride. From there, we got onto the I-205 path and passed through the “Gateway Green” area I talked about here. We basically followed the 205 corridor southward, with a bit of diversion through Montavilla. In Lents we met Christopher, who showed up late due to a “fundraising meeting at the Foundry”. * We were all fairly hungry at this point, as it was 2 pm and we were 20 miles in, so we decided to make a quick diversion to Cartlandia off of the Springwater Corridor. The recon team goes deep. After this, things got really interesting, as we got off the beaten path and skirted the Boring Lava Field on the south edge of Portland. 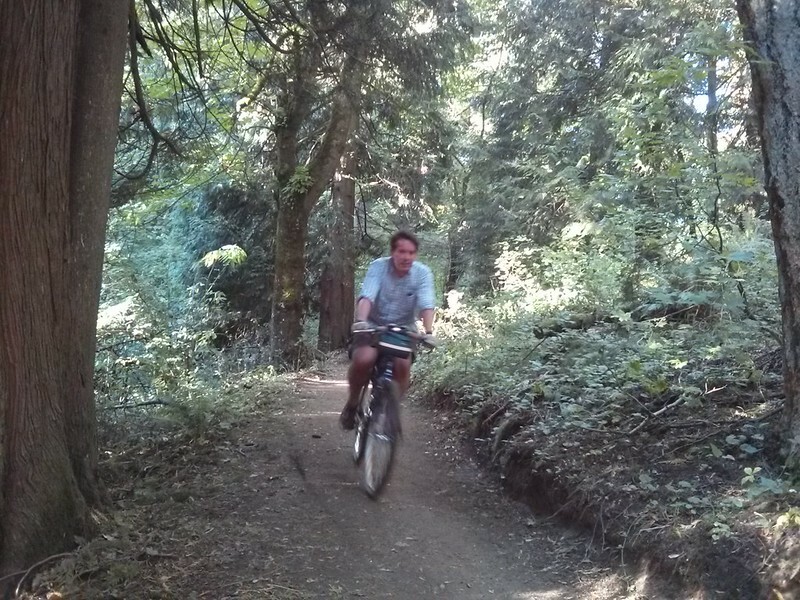 SE Flavel gave us some roller-coaster action for a mile or so, and then we were at Cedar Crossing, the only covered bridge in Multnomah County. In true “rough stuff” tradition, a few folks decided to do a recon mission down what appeared to be an overgrown road/path that led along Johnson Creek from Cedar Crossing. Not much was found, besides some late season blackberries (which was reward enough for Eric) and Chris reported a few tangles with brambles. Then on to the last butte: Powell. We approached it from the southwest, heading up the trail through the cedars. I was worried that the area would still be a wet quagmire from all the rain, but it was surprisingly dry. 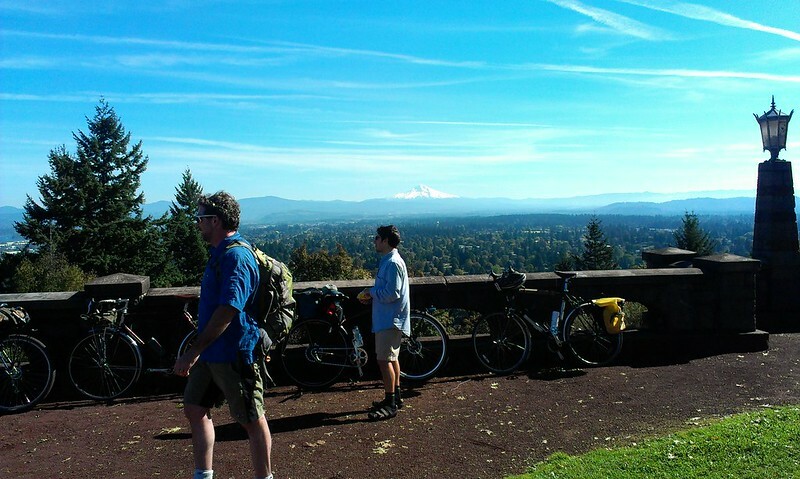 And of course, one of the most magnificent views from Portland greeted us at the top! 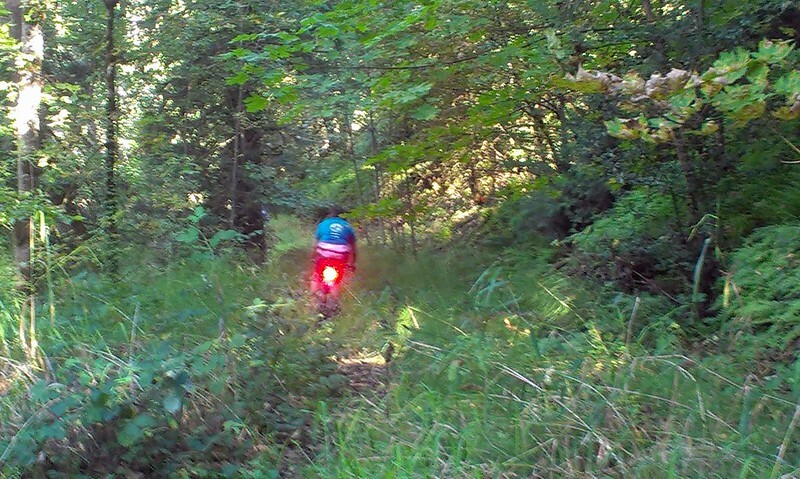 Me descending the trail in Powell Butte. Photo by Christopher Chen. At this point it was 5pm and a few folks dropped off the ride. The remaining few wound their way back up to Montavilla where we enjoyed celebratory beer and pizza. All in all, it couldn’t have been a better Country Bike Ramble. The route, 35 miles, was a bit more ambitious than the last one, but with a nimble amount of people it didn’t drag in any sections. There was just the right mix of paved and unpaved, flats and climbs. And it didn't pour on us, nor were there any mechanical issues like the last ride. I doubt I’ll pull off another long one like this during the winter, but I may attempt a shorter one. Stay tuned! More photos here and here, and also here. *By consensus, we on the ride have determined that must be a euphemism for something. Sounds like a fun ride, glad you got some actual September weather. My realization here in Seattle is that June and September switched slots this year; it was about the nicest June I can remember and certainly the rainiest September I can recall just the opposite of what normally happens here in Cascaida. Well, I certainly had a great time on this ride. Thank you, Shawn! Never new where we were going to but I never had a doubt that it would be another enjoyable route. The day was simply fall perfect. Maintaining a beautiful balance between sun and temperature. I was smiling during the entire ride. Also, the mix of other riders was another source of fun! Could not have asked for a better group of riders to ramble with. That goes for each one of them. I hope to ride again with you all soon! Again, thank you, Shawn for sharing your knowledge and discoveries with us all. Loved it!!! Do you have this mapped or a turn-by-turn of the route? Unfortunately, no. I had a prototype route that I used for the planning, but I diverged quite a bit from it quite a bit. Even if I did go back and try to map the actual ride, a lot of the roads don't show up on Google Maps, so it makes cue sheets a pain.